For other people named Dan Harrington, see Dan Harrington (disambiguation). Information accurate as of 12 September 2010. Dan Harrington (born December 6, 1945) is a professional poker player, best known for winning the Main Event at the 1995 World Series of Poker. He has earned one World Poker Tour title, two WSOP bracelets, and over six million dollars in tournament cashes in his poker career. He is also a member of the Poker Hall of Fame. Harrington chose his own nickname "Action Dan" even though he is known for being a tight conservative player. He is a distant cousin to both professional golfer Pádraig Harrington and former NFL quarterback Joey Harrington. Harrington was born in Cambridge, Massachusetts. Currently residing in Santa Monica, California, Harrington is a former champion backgammon player and U.S. chess master (he won the 1971 Massachusetts State Chess Championship). Before becoming a poker professional and businessman, Harrington worked for many years as a bankruptcy lawyer. He also played poker against Bill Gates while Gates was at Harvard. Some of his earlier poker experience came from the Mayfair Club in the mid-1980s, where he played with Howard Lederer, Steve Zolotow, and Erik Seidel. In addition to being a successful professional poker player, Harrington also works in real estate and the stock market. Mr. Harrington is a co-founder and former member of the Board of Directors of Anchor Loans, a hard money lender to fix-and-flip and rental property investors that is headquartered in Calabasas, CA. Harrington co-founded the company in 1998 with two poker buddies, Jeff Lipton and Stephen Pollack, and served as its first Chief executive officer. The trio used their poker winnings to provide quick bridge funding to real estate rehabbers. Anchor Loans has since funded more than 5.3 billion in loans and has been profitable every year since its inception. Harrington retired from Anchor Loans in 2010, but remains a shareholder. He has also stated during interviews about his poker career, that he is there for the money, not the fame or glory. Also unlike many professional poker players, Dan considers himself only a part-time player due to the fact that he spends a large amount of his time on his business interests. He usually only plays a few events at the World Series of Poker each year and plays in occasional World Poker Tour events and a few other tournaments. Harrington first cashed in the World Series of Poker in 1986. The next year, in only his second WSOP cash, Harrington made the final table of the Main Event; he finished in sixth place in the event, which was won by Johnny Chan. Harrington's friend and fellow Mayfair Club member, Howard Lederer was also at this final table, finishing fifth. 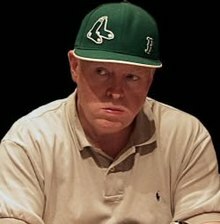 Sporting his iconic green Boston Red Sox cap, Dan Harrington is known as a crafty, tight-aggressive player, employing starting hand standards that are stricter than most professionals. When he reached the final table at the 1995 Main Event, he set the runner-up, Howard Goldfarb, to bluff for all his chips in the final hand. At the time of his Main event victory, Harrington lived in Downey, California. Also, in 1995, he won a bracelet in the $2,500 No-Limit Hold'em event for $249,000 and the Seven-card stud event at European Poker Open in London. He made his first final table at the World Poker Tour (WPT) in 2005, winning $620,730 for his second-place finish to Minh Ly in the Doyle Brunson North American Championship. In 2007, he won the Legends of Poker for a prize of $1,634,865. In 2008, Harrington made his first appearance on the NBC show Poker After Dark in the episode titled "Mayfair Club." This tournament brought together poker players who had played at the legendary Mayfair Club in New York City. The other players in the tournament with Harrington included professional poker players Lederer, Mickey Appleman, Steve Zolotow, Jay Heimowitz, and Mike Shictman, the owner of the Mayfair Club for many years. Harrington busted out first, finishing in sixth place. The tournament was won by Heimowitz, who defeated Lederer in heads-up play. His solid play allows him to make it to many final tables at large events. He won the World Series of Poker (WSOP) Main Event in 1995 for $1,000,000. He has made three other Main Event final tables: placing sixth in 1987 for $43,750, third (out of 839 players) in 2003 for $650,000, and fourth (out of 2,576 players) in 2004 for $1,500,000. Because of the increased number of participants, his run of back-to-back Main Event final tables in 2003-04 has been called the greatest accomplishment in World Series history, particularly by ESPN poker announcer Norman Chad. This feat was later matched by Mark Newhouse in 2013 and 2014. As defending champion in 1996, Harrington made another deep run in the Main Event, finishing in 17th place and earning $23,400. He also cashed in the 2009 Main Event, finishing in 252nd place for a $32,963 payout. Harrington, Doyle Brunson, Carlos Mortensen, Scotty Nguyen, Joe Hachem and Ryan Riess are the only six people to have won the World Series of Poker Main Event and a World Poker Tour title. As of 2014, his live tournament winnings exceed $6,600,000. More than half of his live tournament winnings ($3,524,476) have come at the WSOP. ^ Rodriguez, Julio (October 19, 2010). "Dan Harrington and Erik Seidel Inducted Into 2010 Poker Hall of Fame". Cardplayer Magazine. Retrieved October 19, 2010. ^ "Dan Harrington Vol. 17, No. 19 Card Player Magazine". www.cardplayer.com. ^ Spousta, Tom (March 3, 2005). "Padraig Harrington goes clubbin' in USA". USA Today. ^ "Dan Harrington's profile on The Hendon Mob". The Hendon Mob Poker Database. This page was last edited on 4 January 2019, at 03:34 (UTC).